This is waaay up the list of one of the most popular locations to photograph in Arkansas. Every nut and their brother has a photo of Twin Falls and everyone else has been there. If you haven’t, I highly suggest it! 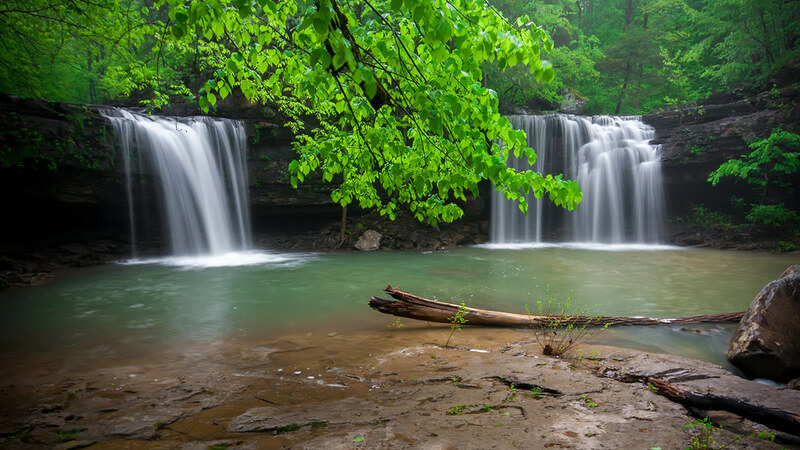 It’s quite possibly one of the most beautiful pair of waterfalls in all of Arkansas. Iconic comes to mind when trying to describe the beauty that is Richland Wilderness. Giant rock boulder gardens, waterfalls everywhere, river otters frolicking in the water… it’s nothing short of the epitome of the Arkansas outdoors. This particular trip was part of the Arkansas Nature Photographers Spring Gathering of 2010. Mike & Karla Hall, Brian Cormack, Matthew Kennedy, and I all made the 3 mile trek into Richland that day in a light drizzle which ended up turning into a downpour upon our arrival at the falls. We had to take shelter for at least half an hour from the heavy rain and thunder as it made it’s way over the Richland Wilderness. After the rain cleared we all took out the cameras and captured some wonderful photos. This one in particular was just as the sun was hitting the middle of the pool while the surrounding falls were still shrouded in shade. I love these waterfalls and will always cherish all of the memories made while hiking to them. Got a great story about The Twin Falls of Richland? I’d love to hear about it in the comments!